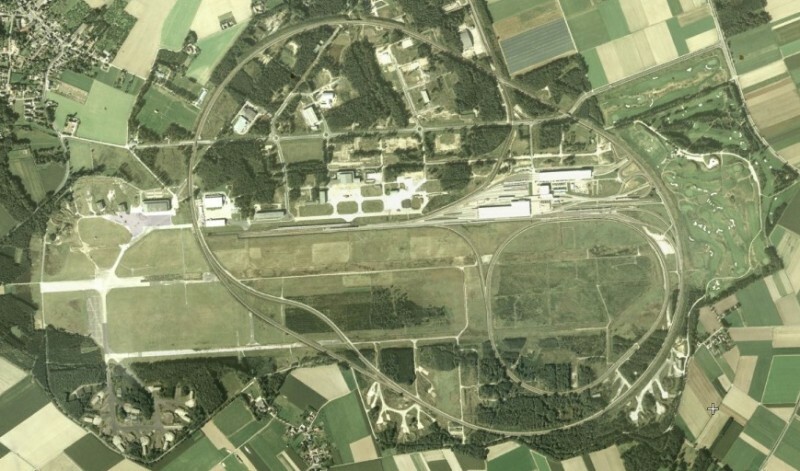 Wildenrath airfield (Royal Air Force Station Wildenrath, also known as RAF Wildenrath, in German: Fliegerhorst Wildenrath, ICAO: EDUW) was an airfield close to the German-Dutch border. 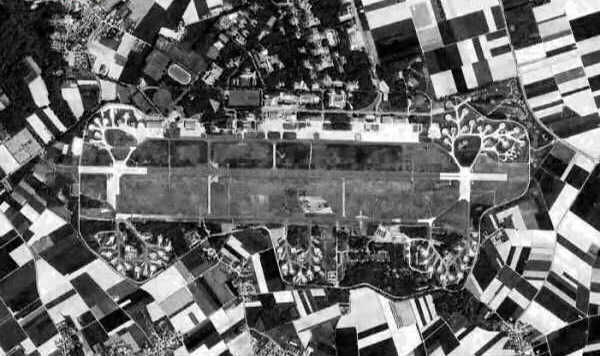 It was the first of four 'Clutch' air bases of the British air forces in Germany (RAF Germany) during the Cold War. The base was named after the village of Wildenrath. Construction began in 1950, and the station became active in 1952 during the rapid expansion of NATO forces in Europe. It initially had a 1830 meter long runway, which was later lenghtened by 610 meters. 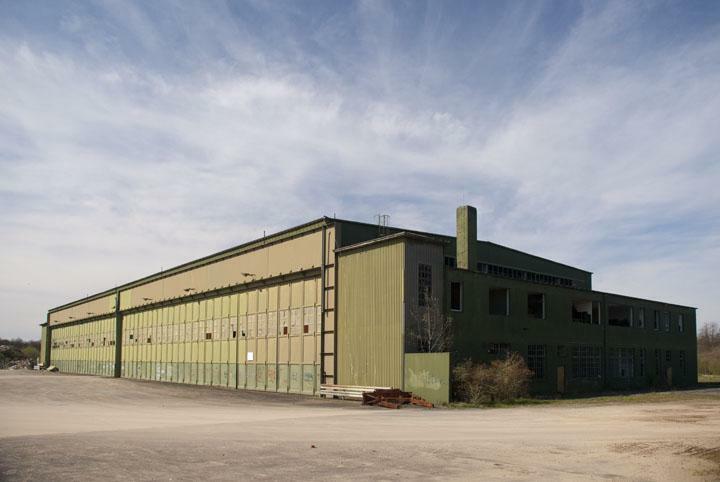 Next to the airfield 180 buildings were constructed as living quarters, which like most of the military buildings were well concealed in the woods. The entire complex was surrounded by barbed wire fences, and patrolled with vehicles and dogs. Senior officers and civilian personnel were allowed to live off base in one of two military neighbourhoods (German: Siedlungs). Security in these Siedlungs was strict: RAF Police patrolled every 30 minutes and each morning the area and any cars in it were scanned for bombs by special teams. Like RAF Brüggen and RAF Laarbruch, RAF Wildenrath fell under the operational command of NATOs 2ATAF (Second Allied Tactical Air Force). From 1953 there were two North American F-86E Sabre squadrons [67 and 71], and a Sabre conversion flight. Around this time, the CO of 2ATAF (former Battle of Britain fighter pilot, Sir Christopher Foxley-Norris) had a Vickers Valetta aircraft as his personal transport. The aircrafts' lower fuselage and wings were kept highly polished by the ground-crew of the RAF Germany Communication Flight at RAF Wildenrath. It was eventually declared un-airworthy due to many of its rivet-heads having being polished off. A communications flight was provided by 60 Sqn (RAF Germany Communications Squadron ), initially with Hunting Percival Pembrokes, later with DeHavilland Devon and DeHavilland Heron aircraft. The Pembrokes had a second, more covert, role of taking photographs of Russian and East German armed forces while flying along the Berlin air corridors. 60 Squadron also acted as visiting aircraft flight for Wildenrath, hosting almost every type of RAF and NATO aircraft and civilian "trooper" BAC-111s and Boeing 747s. 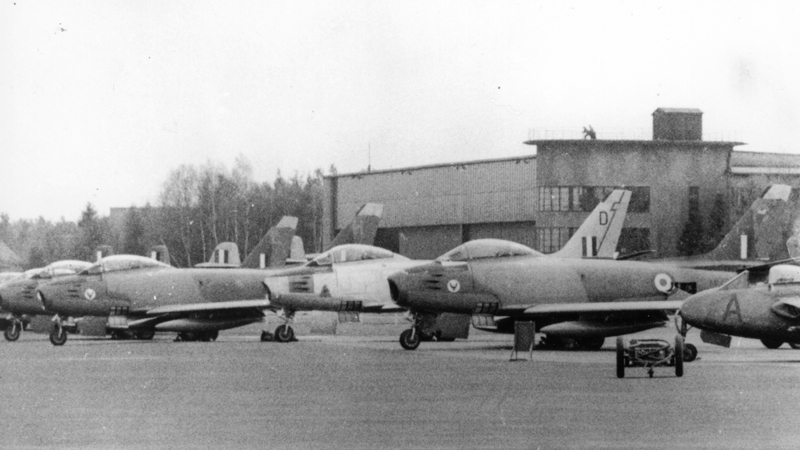 RAF Canberras on the flightline at Wildenrath, ca. 1956 (bywat.co.uk). From 1956 until the 1970s, Wildenrath was home to Nos. 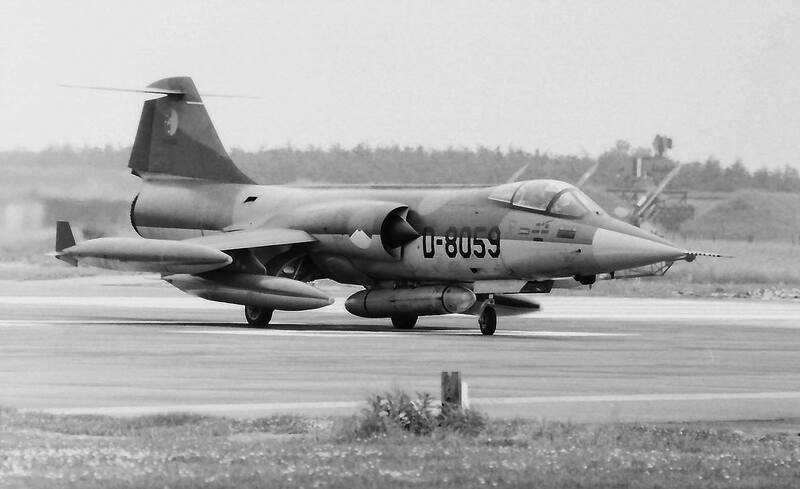 88 (renumbered later to 14) and 17 Squadrons; the former flew B(I)8 Canberras, and was part of the 2nd ATAF tactical nuclear strike force. The locations of their quick-readiness dispersals can still be seen to the south of the old main gate at the west side of the former airfield. No. 17 Squadron flew the PR7 Canberra and the two squadrons' "in house" T4 training aircraft were combined into the so-called "T4 Flight" as a separate sub-unit. As such, it formed a useful additional resource for 2ATAF senior officers to use to maintain their flying hours. In the 1970s, Wildenrath became the home to the RAF "Harrier Force" which included 21(AS) Signal Regt. 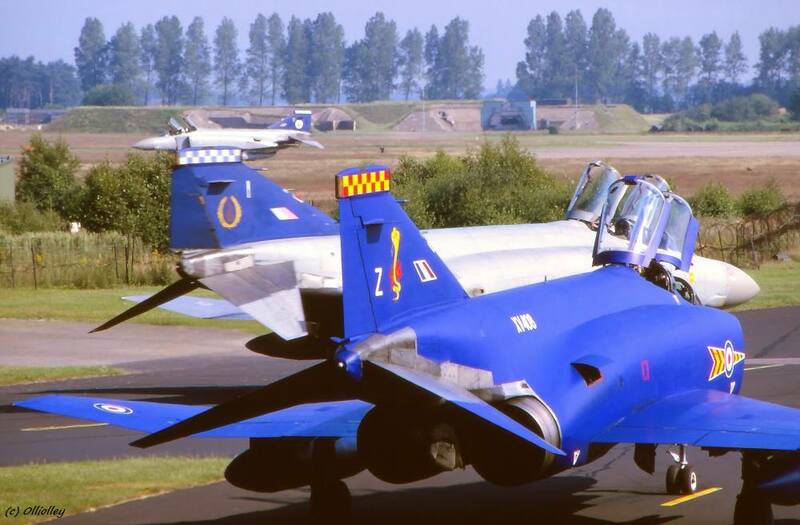 When the Harriers were moved to RAF Gütersloh in 1976, 19 and 92 Squadrons with Phantom FGR.2 were formed at Wildenrath. 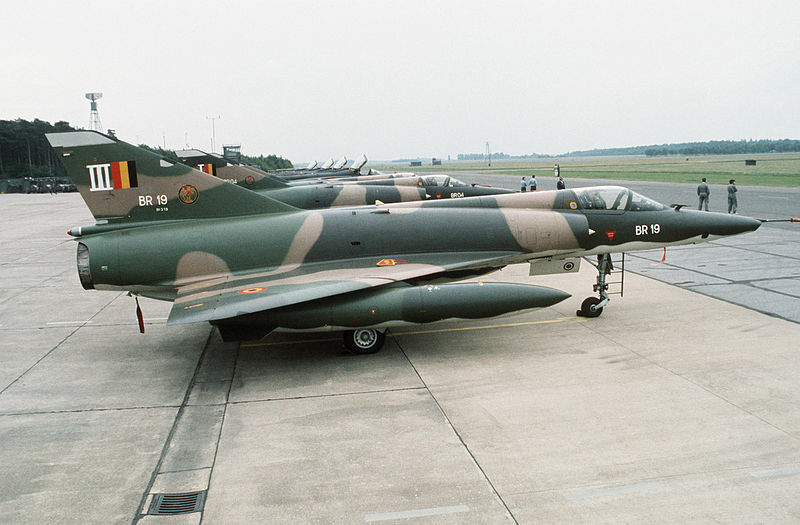 19 Sqn re-formed at Wildenrath in October 1976, and 92 Sqn formed there in April 1977. 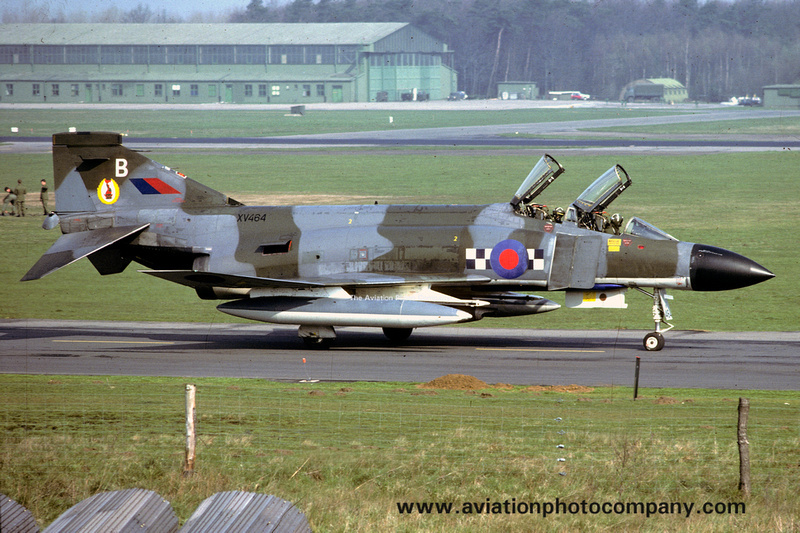 Both units flew Phantom FGR2 (F-4M Phantom II's), providing air defence for RAF Germany (RAFG) and its allies. They flew with the type until 1991. The last flying squadron still present at the time the airfield was to close, 60 Squadron, moved to the nearby RAF Brüggen. 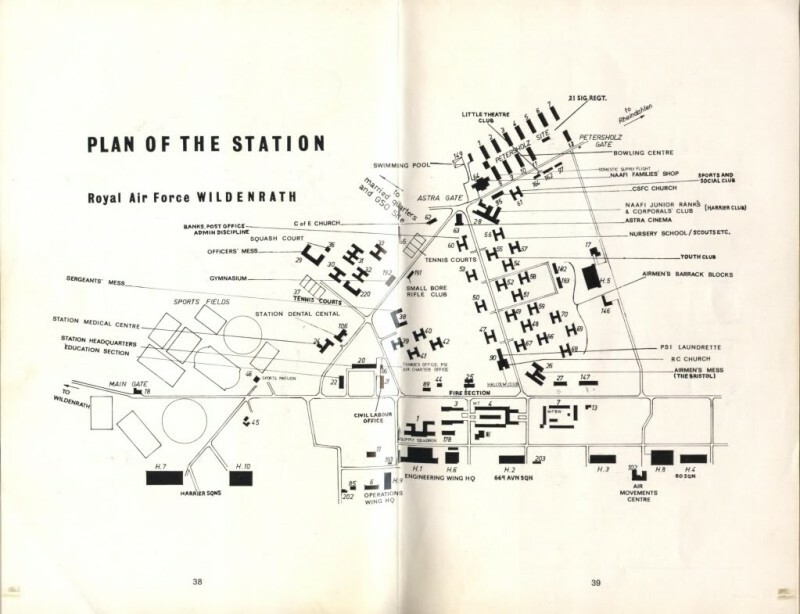 Plan of RAF Wildenrath, presumably ca. 1973 (RAF Wildenrath information booklet, © RAF Germany via Photobucket). Photo of RAF Wildenrath, believed to have been taken in the 1980s (baor-locations.co.uk). 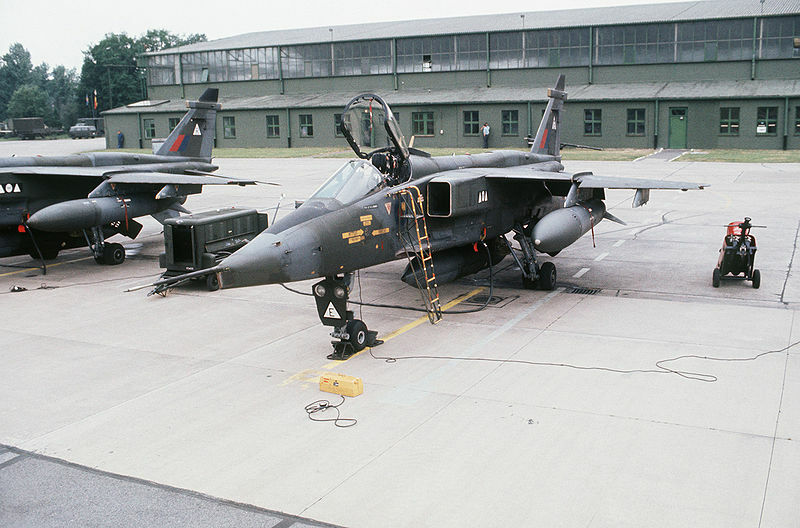 RAF Wildenrath, photographed in 1984 (Mick Gladwin, on Flickr). 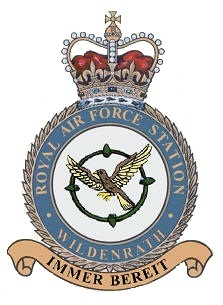 With the Royal Air Force having no use for site of the former RAF Wildenrath after the end of the Cold War, it closed the airfield on 1 April 1992. After closure, the base was handed over to the German authorities. 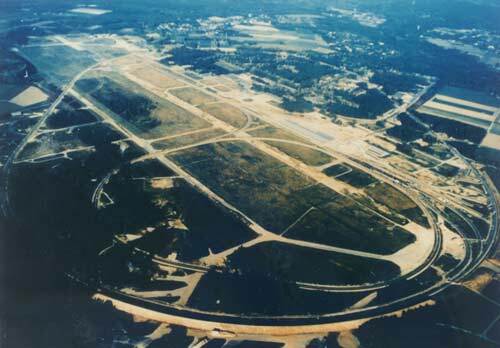 The air base was initially used as an area for rock concerts. In 1993 the first concert, 3 day festival "Rock over Germany", took place. The next two years it became home to a reggae festival called 'Summerjam'. Hangar 5 was used to host large events of televison station 1-Live as late as 2001. Unlike other air bases, the airfield was not converted for civilian use as an airport. The domestic site is now predominantly military. It is a community housing estate for both the Joint Heaquarters for NATO, and Javelin Barracks/Elmpt Station (former RAF Brüggen). 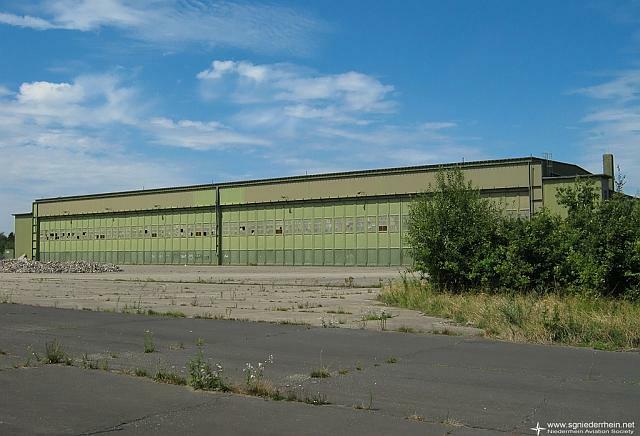 The original airfield site and immediate surroundings were taken over by Siemens AG under their Transportation and Automotive business arm (Siemens Mobility) as their railway testing centre. 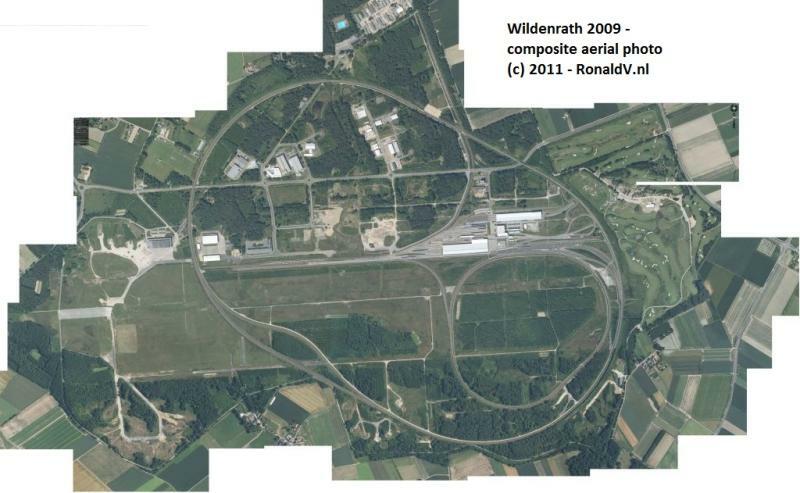 It is now known as the Test- and Validationcenter Wegberg-Wildenrath, which opened in 1997. 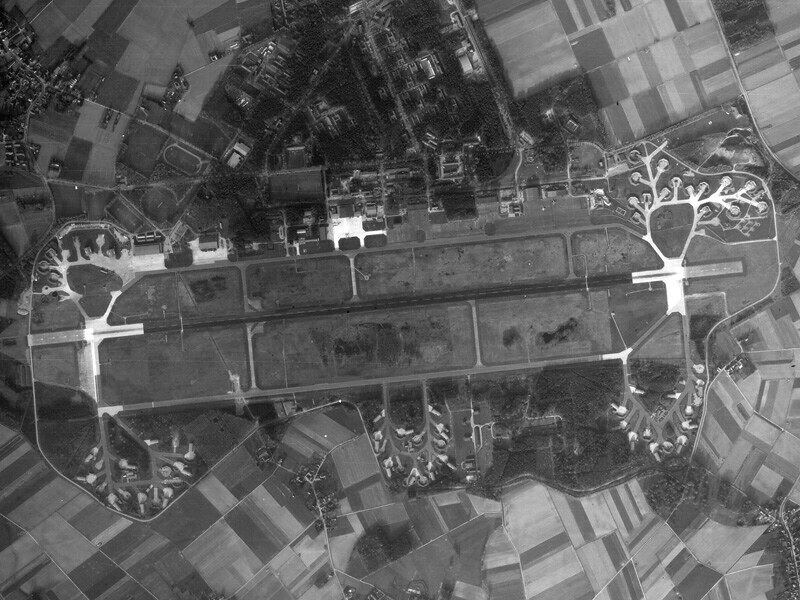 RAF Wildenrath, presumably ca. 1997, just after opening of the Siemens railway testing facility (source). RAF Wildenrath, ca. 2001, less than ten years after the RAF left the airbase. 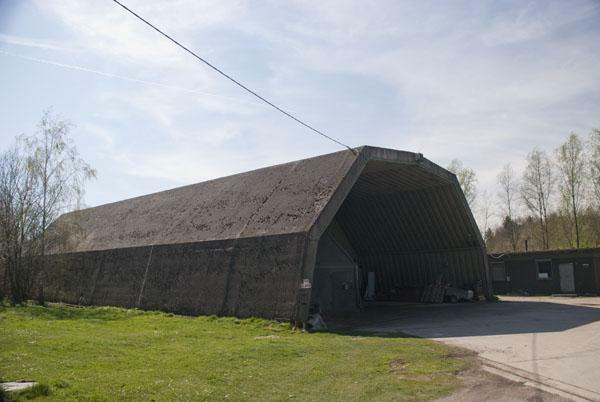 Many of the old airfield buildings still existed. 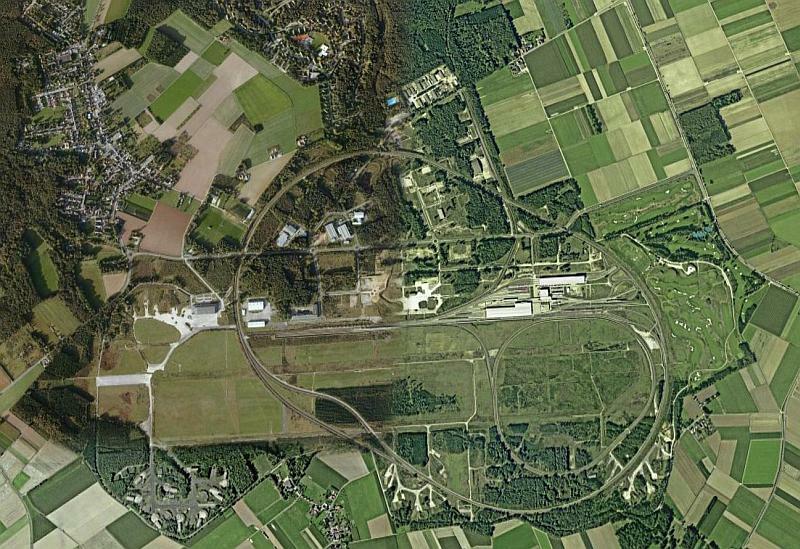 By 2007 the railway test tracks had taken over considerable areas of the airfield. A very small part of the runway, the taxiways, dispersals and hangars still existed, although much of it was covered with dirt and overgrown. All but the western threshold and over-run of the runway had been covered with about 2-3 feet (0.50-1m) of dirt. 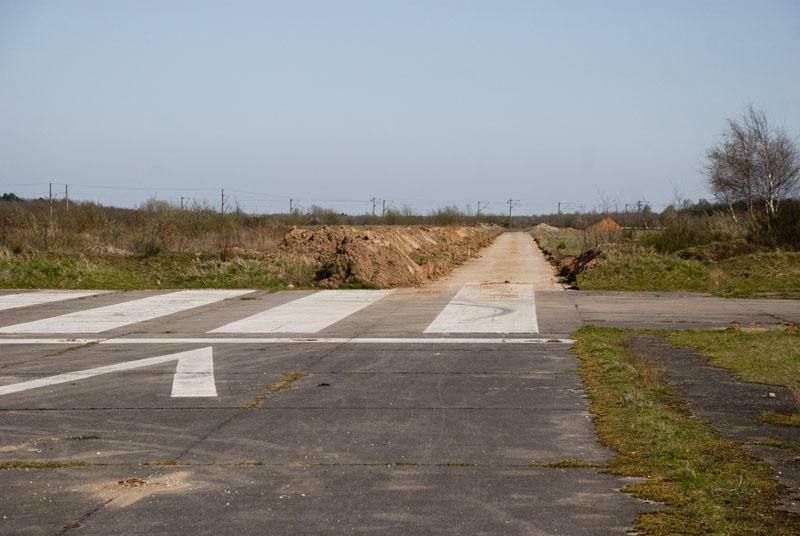 The eastern runway threshold had been turned into a Golf course, rather than the site of Bloodhound surface to air missiles that used to be there. The north-east dispersal was completely taken over by sidings, workshops and shunting loops for the Siemens Test Centre. Of the southern dispersals, the central and eastern were bisected by the main railway oval test track. In January 2008 only the south western dispersal and Hardened Aircraft Shelters (HAS) remained, but these have since all been removed. The surviving taxiways are being used for recreational purposes by the local civilian residents. 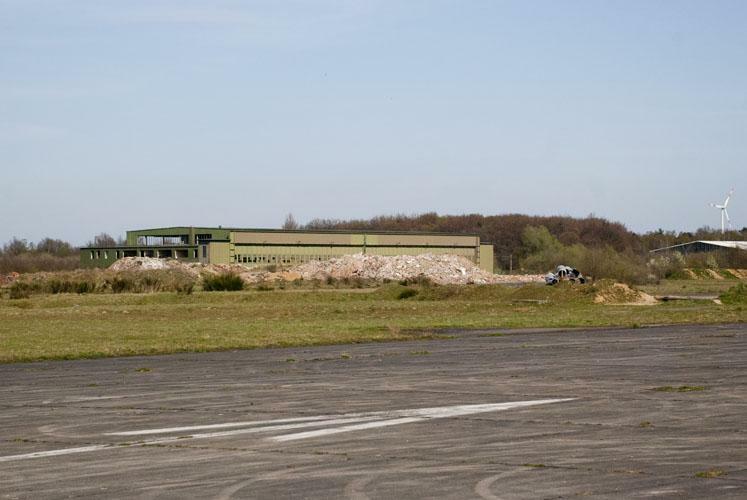 During a visit in April 2011 I found about half the parking area in front of the remaining hangar was covered with piles of debris from demolished buildings. The hangar, RWY 09 treshold and southwestern dispersal area were freely accessible, although you could not go inside the hangar because every opening is either welded shut or locked. 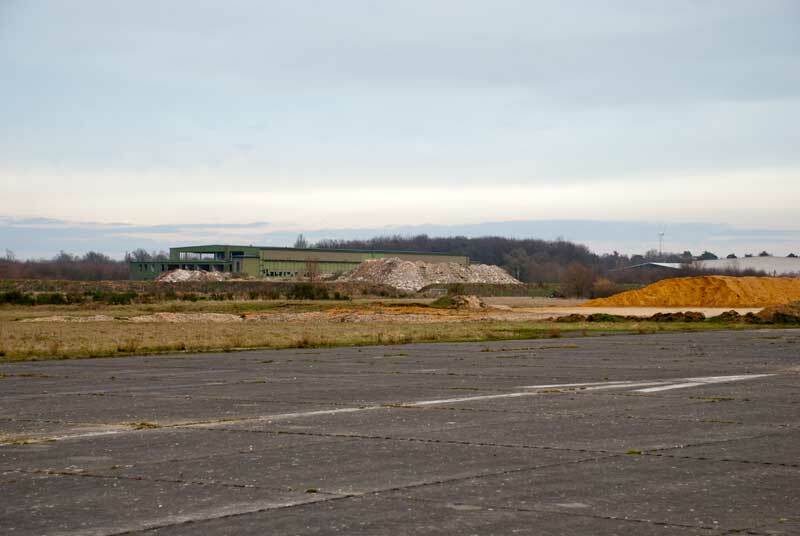 A 3 meter wide track on the runway had appearantly recently been cleared, reexposing that part of the runway from the treshold all the way to the Siemens test track. On the southwestern dispersal not only the HASs but also the dispersals had been removed, leaving only the taxiway. At least one HAS still existed on the base: it stood alone a few hundred meters south of the golf course, to the southwest of Moorheide. Only the treshold of the former runway (marked with a VERY faded X for closed) is left of a 2440 long stretch in 1990. 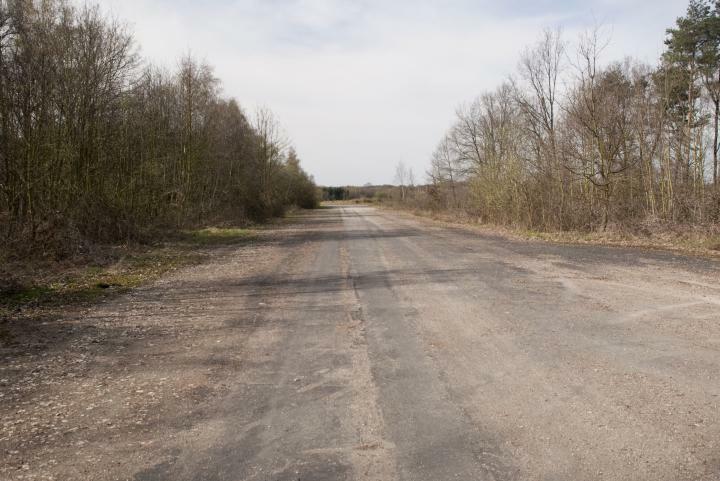 View from the taxi-track of the SW-dispersal area towards treshold 09, RAF Wildenrath, April 2011 (RonaldV). Debris continued to be piled up near hangar 7 and the dispersals on the northwest side in January 2014. While the hangar still stood, signs on the fences indicated a lot of the building had been ravaged as rewards were awarded for information that would lead to thiefs of hangar parts, mostly drainage pipes (RonaldV).